Ribosomes are composed of two subunits: a large subunit (right) and a small subunit (left). Of course, the term “small” is used in a relative sense here: both the large and the small subunits are huge compared to a typical protein. Both subunits are composed of long strands of RNA (in orange and yellow), dotted with protein chains (blue). When synthesizing a new protein, the two subunits lock together with a messenger RNA trapped in the space between. The ribosome then walks down the messenger RNA three nucleotides at a time, building a new protein piece-by-piece. 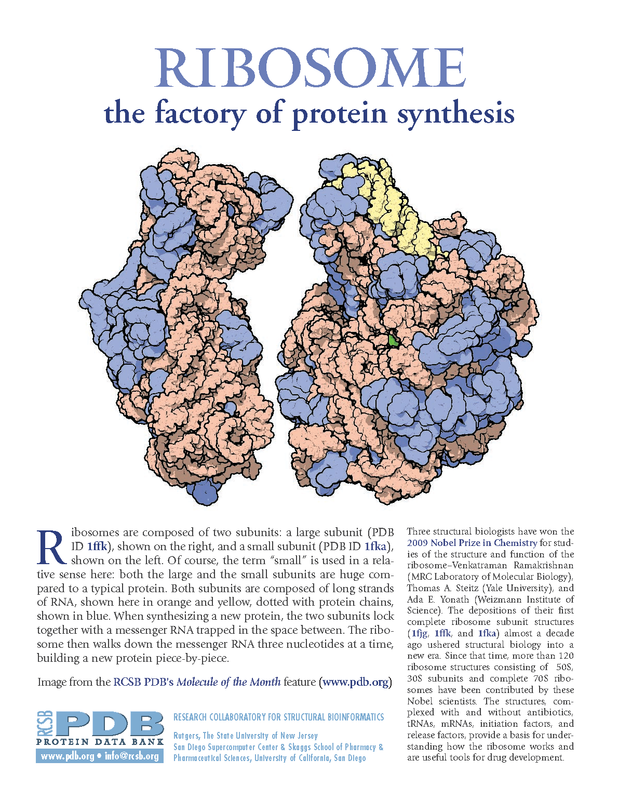 This flyer commemorates the 2009 Nobel Prize in Chemistry for studies of the structure and function of the ribosome.